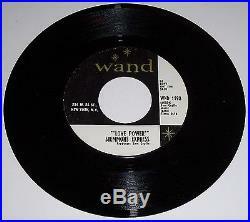 This is an original DJ PROMOTIONAL 45 rpm recording by STEMMONS EXPRESS called “LOVE POWER” on the WAND label(WND 1198). The record is CONSERVATIVELY graded VG+(A FEW LIGHT PAPER SCUFFS). The label is in excellent condition(see picture). The flip side is called “WOMAN LOVE THIEF”. The item “STEMMONS EXPRESS 45 dj promo LOVE POWER / LOVE THIEF Northern Soul R&B BlueVG++” is in sale since Thursday, November 03, 2016. This item is in the category “Music\Records”. The seller is “cougarjacket” and is located in Pittsburgh, Pennsylvania. This item can be shipped worldwide.